On our first visit to this garden it was overgrown with poor lawn, rotten shed, low surrounding old walls and water feature. After meeting with the client we came up with the following brief. The client had a collage of photos chosen from various magazines and the internet. The photos were helpful and gave us a feel for the customers tastes and expectations. 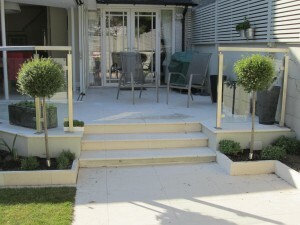 Going on the brief and photos we came up with the following Garden design. 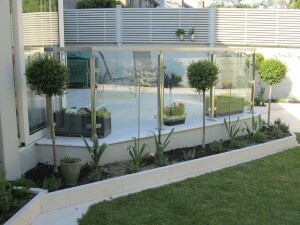 The first job was to clear the garden of all trees, shrubs, perennials and climbers except for the large silver birch. 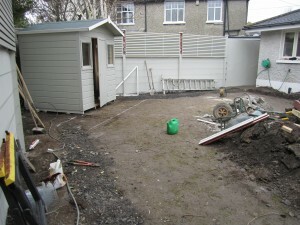 The old shed, water feature, wall extensions and rubbish were all carted to the dump. The water features reservoir and pump were in good condition and retained. Our landscapers started on the old surrounding walls. They were weak and in a bad state of disrepair. To strengthen we plastered the walls twice with a strong concrete render. To strengthen further 4×3 posts were dropped into good sized square holes every 2.3M. The posts were tied to the wall with 150mm express nails and each hole filled with a strong concrete mix. 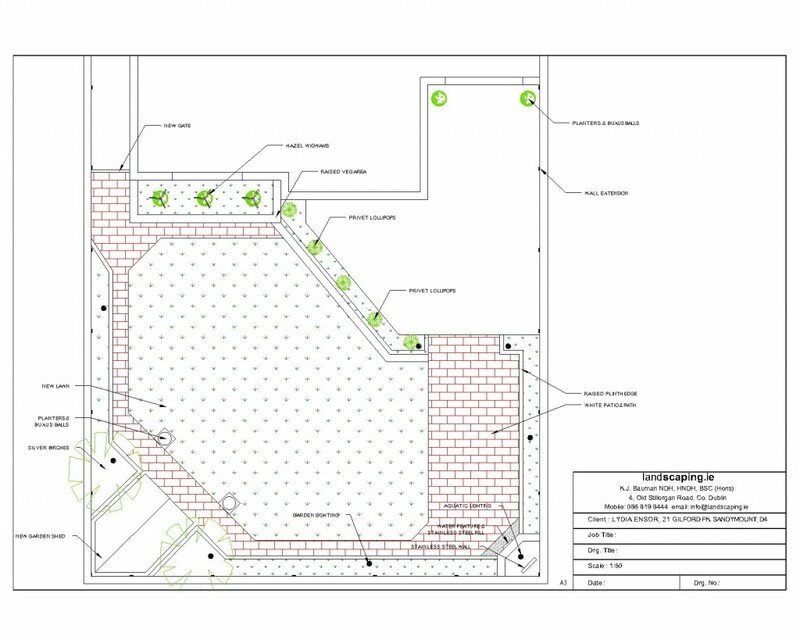 The walls would now be good and strong and the posts would provide the framework for the wall extension sections. To create support for climbers we passed bull wire through each post and tightened with agricultural fence tighteners, this was done on four levels, each level 40cm apart. This worked well and looked great. Next the timber wall extension sections were installed. These 2.3M sections were fitted between the posts. 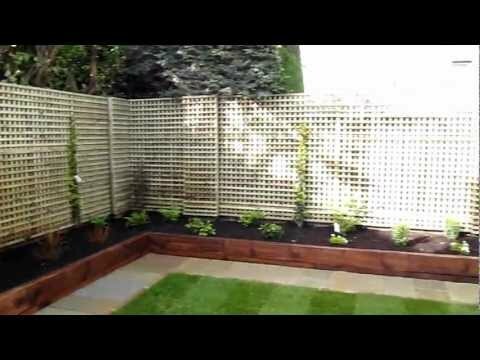 The sections were constructed using the hit and miss style of fencing. The advantage of using hit and miss is that air can travel through the extension resulting in less strain on wall and post. Each post was then cut 50mm proud of the extension level and capped. This minor detail made a big difference. 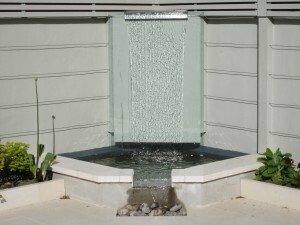 The next job was the water feature. This was created using a 1.7×0.9M rectangular section of toughened glass bedded into a strong concrete mix within a concrete pond sealed with fibreglass tanking. 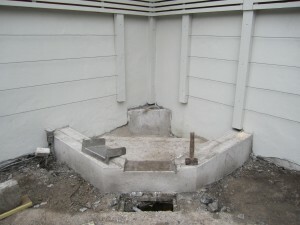 A stainless steel rill was installed to the edge of the pond to create a flow from the pond into the existing reservoir. Water from the reservoir was then pumped up to a 0.6 stainlless steel blade which released a sheet of water across the face of the toughened glass below. The effect created was contemporary with a nice amount of sound. 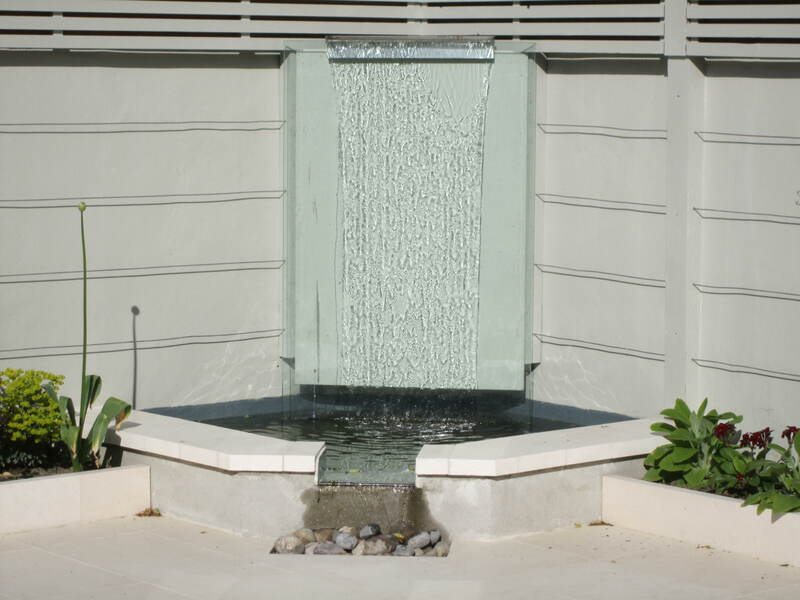 The water feature looked best in sunshine when shadows from the falling water were created. 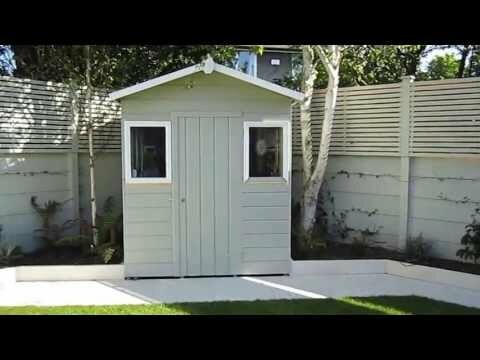 The 8×6 custom built Baumanns garden shed was then installed in one corner of the garden. The shed was made of Scandinavian white deal. The roof was covered in polyeaster unrippable felt. 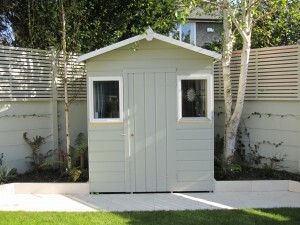 The shed was delivered painted in Color trend ‘Stone Lion’. Many designers try to hide sheds within projects but if a little thought is put into colour they can become features within the garden. The rest of the garden was then painted in the same colour. 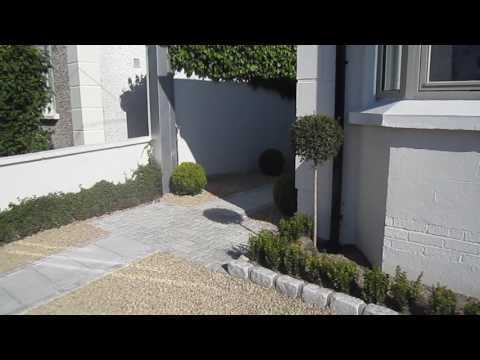 Our landscapers then set about laying the patio, paths, mowing edges and kerbs to beds. The stone used was St Vallier Limestone ordered from Italy, this matched the stone laid in the new sunroom creating a link inside and out. The low voltage garden lighting system was next to being installed. The brands used were Collingwood spike lights for the beds and Oase aquatic lights for the pond. The Collingwood spike lights were fitted with 20 watt bulbs for uplighting of shrubs and 50 watt for uplighting of trees. The Aquatic lights were fitted with 50 watt bulbs and blue filters to give a dividing effect within the garden. Strip lights were also fitted under the overhang of the steps leading into the garden. Garden lighting is a must in all gardens as the effects achieved are magnificent. A topsoil and sand mix was then imported into the garden to make up levels in the beds and to create a level rooting bed for the fine roll out turf lawn. 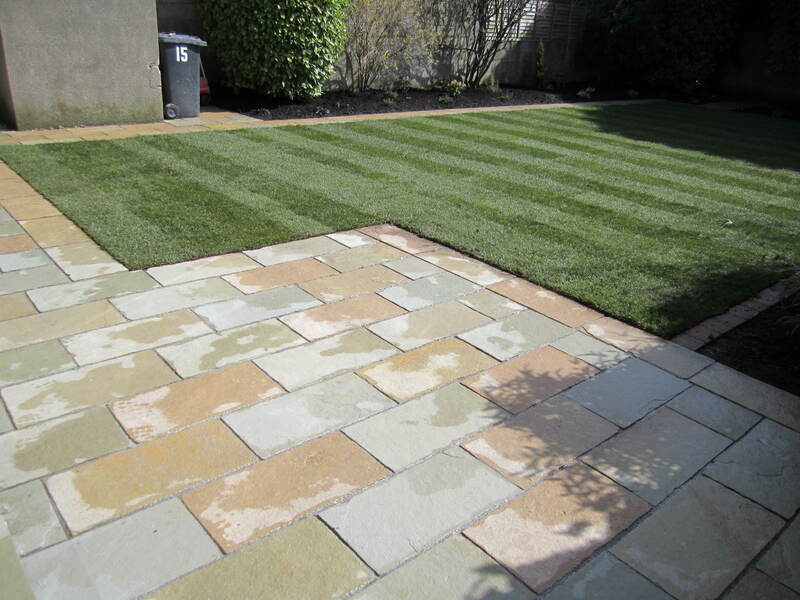 The turf was sourced from Emerald lawns in the North of Ireland who are one the premium suppliers. 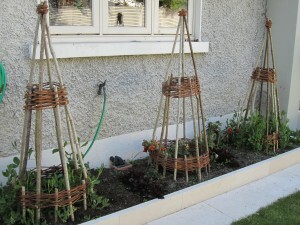 Hazel wigwams were then constructed in the vegetable bed. The Hazel rods were sourced from the ditches of Glencree in County Wicklow. These wigwams will give height to the bed and provide a framework for edible peas and sweet pea. Planting of the garden started with the climbers. Specimen Trachleospernum jasminoides were used as they are not too vigorous and will provide scent when in flower. Each plant was unravelled from its cane and tied to the bull wire climbing frame surrounding the garden. 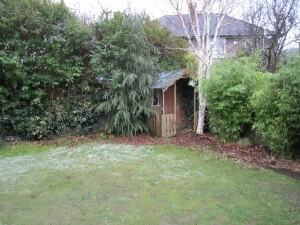 A 5M Betula jacquemontii was planted to complement the existing one, both framed the new shed. 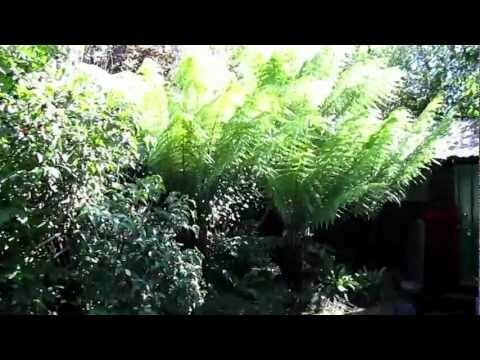 The Birches were under planted with Dicksonia antartica ferns. Standard Ligustrum delavaynums were planted in front of the raised seating area, these complimented the wigwams and were under planted with Allium ‘Christophii’ behind a Lavendula ‘Hidcote’ hedge. The rest of the planting was a mixture of small perennials and shrubs including Euphorbia amyg ‘Purpurea’, Epimedium rubrum, Alchemilla mollis, Heuchera ‘Purple Palace, Ophiopogon plan ‘Nigrescens’, Rosmarinus off ‘Prostratus’, Sedum tel ‘Munstead Dark Red’, Skimmia japonica, Libertia ‘Gold finger’, Paeonia ‘Gardenia’, Digitalis ‘Alba’ and Astelia chat ‘Silver Spear’. 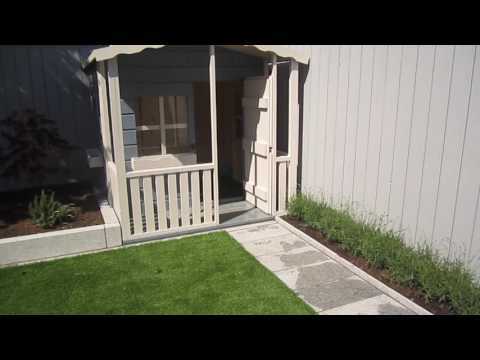 This landscaping project was completed within budget. 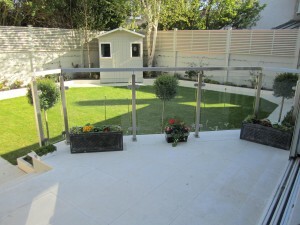 The client was very happy with the results as we achieved her expectations. 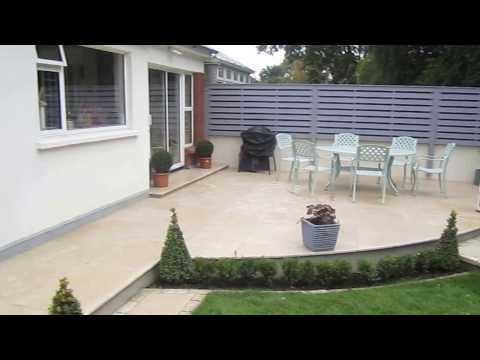 If you like what you see and would like a professional Landscaping and Garden Design service contact please Kevin Baumann on 086 8198444.